It’s so much fun receiving boxes of new fabrics or notions! Feels like Christmas every week in the store, and I love it! Always something new to put in the newsletter! So, sticking with the Christmas in July theme this week, let’s talk stocking stuffers! Over the past week, we received two fun items, that would make a great addition to your stocking stuffers! 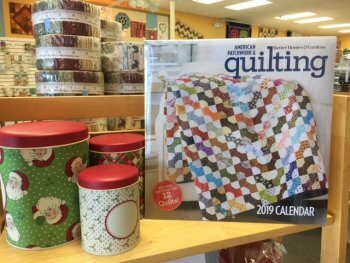 First, we have the American Patchwork and Quilting 2019 Calendar, where each month has a pattern for a quilt. The pictures are gorgeous and the directions seem straight forward. Now, there’s a New Year’s Resolution…a quilt a month! 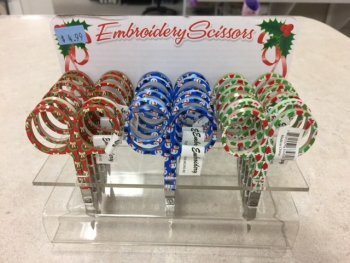 Next are these adorable, yet very sharp, embroidery scissors! They are cute, festive, and fun! I might add these as the bow to a gift for a friend instead of sticking them in a stocking. Just saying, might want to be careful putting your hand in a stocking with that sharp point….OUCH! 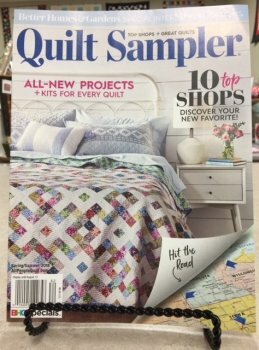 We received another order of Quilt Sampler, for those of you who were wanting to purchase one. The Piece Works in Winterset is one of the featured stores in the magazine. Please stop in and pick one up. Join us for a 2-day fun, creative Pfaff Event with SVP Worldwide Elite Educator, Christine Harlan! Christine Harlan, SVP Worldwide Elite Educator is a designer, educator and multi-media fiber artist who has been inspiring women and men for over 30 years in many areas of her expertise. Christine's knowledge as an artist and educator includes the many facetts of garment design and construction, pattern making and draping, free motion as an artform, home decor, sewing for children, heirloom techniques, and art quilts. Christine's goal is to inspire you to see beyond what you know now, to explore all that's possible, to help you overcome your sewing limitations, all while you discover your own sewing passion and individual artistry. On Wednesday, July 18th from 10:30-11:30 and from 3:00-4:00, Christine will be demonstrating the Creative Icon and the Performance Icon. This is your chance to see the two beautiful machines in action and ask any questions you might have about the machines. Christine is definitely an expert on the Pfaff sewing machines! This is a free event, sponsored by Creekside and Pfaff! On Wednesday, July 18th from 1:30-2:30, Christine will be doing a class called Fancy Feet Fun...learn how to use the wonderful Pfaff accessory feet to add details to your sewing and quilting projects. Fringe, chenille, beading, piping, couching, cording pintucking and braiding accents are only few of the many decorative options you could learn at this fancy feet workshop event. This is a free event, sponsored by Creekside and Pfaff! Next Thursday, July 19th from 1-4, Christine will be bringing with her, up to 11 Creative Icons for her make and take workshop, for us to play/sew on! I highly recommend this opportunity to everyone, as it will be fun and educational! Also, the class is only $10 and in 4 hours, you will get to make this cute little bag! Pre-registration is necessary for the Thursday class and please bring your sewing kits with you. Saturday, July 21st from 10:30-4, come have fun making your own custom fabric wallet! The Diva Frame Wallet includes 6 card pockets, 2 open pockets and a zippered coin pocket. We will discuss the different interfacings, so important to purses and bags and learn to set a zipper. Not scary at all! Cost for the class is $40 and includes the pattern. Karen Macon is our instructor for the day. Again, this week, anything Christmas is on sale at 15%. All you have to do is show this coupon at time of cutting of fabric or purchase. Sale goes from 07/10 through 07/16.